Q: What are the differences between the UK VHS releases and the uncut releases? Q: What is 'Rambo III' about? An array of forgettable extras and a glow stick. 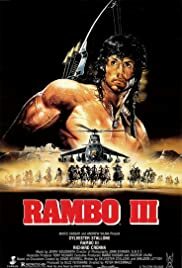 Peter MacDonald's Rambo 3 is far removed from Ted Kotcheff's credible First Blood and follows the Rambo icon established in George P.Cosmatos' First Blood Part II. What's notable from the outset is the real life political and conflict shifts since '88, as the Americans are helping the Afghan rebels achieve freedom from the invading Russians. As the cold war ended over night this appeared to hamper this Rambo's already out of date story line box office success. That said, paradoxically it has made Rambo more significant and highlights how quickly an alliance can shift which may stick in some viewers throats satirically or not. Richard Crenna once again plays Col. Trautman who is captured behind enemy lines and Rambo (Sylvester Stallone) must stage a solo 'unofficial' rescue mission. Again, Stallone is in obscene physical shape for this instalment, and is 100% committed to his role as Rambo. There's a brief appearance by Kurtwood Smith who gives the usual effective performance. Sasson Gabai and Spiros Focás are part of an effective supporting cast. However, the Russians are an array of forgettable extras and Marc de Jonge Colonel Zaysen just can't escape from the stereotype script he's been given. Rambo 3 is very watchable but in retrospect it's fraught at times by diplomatic changes of the time, even more so in today's climate and ironically this takes the fun out this instalment. Jerry Goldsmith's score is once again excellent and MacDonald who was handed the directing reigns last minute does his best. There are a few stand out scenes all of which display Stallones refined abilities, a stick fight and horse game. Nevertheless, Sylvester Stallone and Sheldon Lettich screenplay is all comic book dialogue. The film looses memento in the second act and by the third you don't care who lives or dies. There's gun's, helicopters, bullets, explosions, monks and glow-sticks if that's your thing you'll love Rambo III.